Jisc is one of the UK’s leading edtech organisations providing support and advice mainly to the FE and HE sectors. The annual Digifest conference is one of their main events and draws a ggoodcrowd of educators eager to share their expertise with one another. 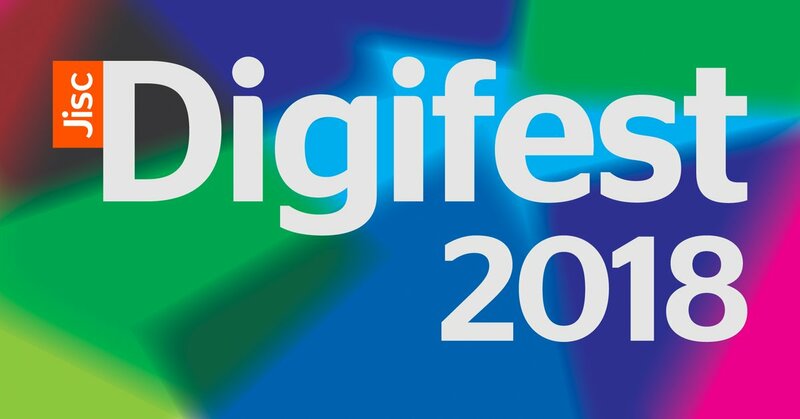 In Jisc’s own words ‘Digifest aims to inform, inspire and prepare you for the digital challenges ahead’. The 2018 Jisc Digifest was a week earlier this year being held on the 6th and 7th of March at the Birmingham International Convention Centre. Digifest is a great way to meet educators from around the UK and hear about interesting and innovative projects across a wide spectrum of disciplines. If you don’t believe me, here is are a few words from Scott Hayden (Basingstoke College of Technology) who is a member of the events steering group. For this year the event theme was ‘Harnessing the power of edtech: thriving in a digital world’. The line-up of speakers and presentation certainly lived up to that statement. Nick Woolley, head of library services at the University of Northumbria. Nick has spent a lot of time looking into the role of the library in the 21st Century, particularly how technology, together with ‘traditional’ librarian skills of knowledge and information management open new opportunities. If I was to pick some of the main topics which formed the bulk of the presentations then I would say a large proportion talked about various aspects of digital literacy and the need to embed these key skills into programs to enable us to meet the needs of our students, especially regarding employability. Augmented and Virtual Reality was also extremely popular not only for presentations but also the exhibitors: my personal favourite of these being the tractor simulator. It is worth mentioning that learning analytics was also a fairly prominent topic but not as much as it has been in previous years. I would recommend looking through he program as many of the presentations and their slides are now available to view (View event program here). A stand out presentations for me that I think many might find interesting was a presentation by the Blended Learning Consortium (Speaker: Peter Kilcoyne, ILT director, Heart of Worcestershire College). The Blended Learning Consortium (BLC) talked a little about themselves and their plans for the coming year. For those of you not familiar with the BLC it is an organisation made up of 93 FE institutions (and growing) who use their combined membership fee (£5000pa) for among other things the design of courses and learning content. For this annual fee they get an annual budget in the region of £500000 to spend and this grows with each new member. Along with this and collective bargaining for software and services (They do get some hefty discounts in some cases about a 1/3rd of the usual licence) member make back the annual sub many times over and have top notch professional learning content to show for it. The plan is for the BLC to create a BLE HE for universities. Granted, course content in the HE sector is a lot more individual there are also a lot of core and support topics which are relatively uniform whatever the intuition for example Health and Safety, COSH regulations, a range of topics for Field trips (compass and GPS use, map reading etc.). That along site the collective bargaining power for software and services there is plenty of opportunity to save a lot of money. My takeaways from the event. I think the thing that struck me when reflecting on the event was that as a HE institution we are not an island. Although there is a lot we can and should do to distinguished ourselves as a leading educational establishment we are going to have to acknowledge the difficulties the modern educational environment puts us in. We are going to need to work smarter rather than harder. With budgets tightened and still only 24houres in a day choosing to work collaboratively and collectively will afford us the space, time and money to focus on what makes us unique and a university students will want to come to.